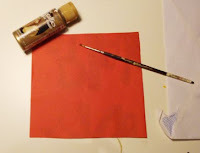 The simplest of crafts to start your year lucky! 1. 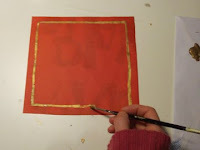 Paint a simple single line border about a half inch from the edge of you paper with the gold paint. 2. Turn your paper so it makes a diamond shape, not a square. Copying the character found HERE, paint the Chinese word for luck (FU) in the center. 3. 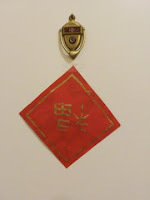 Before New Year's Eve tape your banner right side up on your door to welcome in luck! 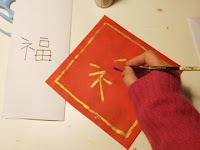 because in Chinese the "reversed fu" is homophonic with "fu dao le" pronounced as "fu comes." 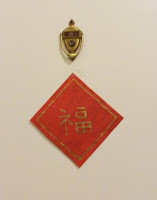 The upside down fu becomes a pun that means "good fortune has arrived!"